Last week, I wrote about particular preeminent peeps profoundly peeved with the Iraq Study Group report. I also bought a new thesaurus. Chief among the peeved are Iraq's Kurds. On Dec. 10, Iraq's president, Jalal Talabani (a Kurd), told British newspaper the Guardian that the ISG report's recommendations are "dead in the water." The American press didn't report Talabani's objections because, when discussing Iraq, they only understand sand and desert metaphors. If Talabani had said that the ISG had "crossed a line in the sand" or that "James Baker's camel be ridin' dirty," the press would have been all over it. According to the Guardian, Talabani's primary objection to the ISG report is its recommendation that thousands of U.S. soldiers be embedded within Iraq's security forces. To do so would compromise Iraqi sovereignty, Talabani says. But for Talabani to claim that the embedding is his main objection to the ISG report is a bit like claiming he watches pornos every night because of the soundtrack. Simply put, Talabani's real objection to the ISG report is that several of its recommendations (as laid out in last week's column) would reverse Kurdish autonomy and reduce the likelihood of an eventual independent Kurdish state. To Talabani and Kurds, the ISG report hints that yet another American betrayal of the Kurdish cause could be in the making. "We can smell the attitude of James Baker in 1991 when he liberated Kuwait but left Saddam in power," Talabani told the Guardian, referring to the ISG principal and secretary of state under Bush the elder, James Baker. The stank attitude to which Talabani refers was the one taken toward the first Gulf War. Shortly after the United States rescued Kuwait's vast oil reserves from Saddam's clutches, Bush the elder publicly beseeched Iraqis to rise up and overthrow their mustachioed menace. Iraq's Shi'ites (in the south) and Kurds (in the north) obliged, but were slaughtered by Saddam's forces while U.S. forces sat nearby and did nothing. Hundreds of thousands of Kurds were forced from their homes before public pressure forced the elder Bush administration to intervene with humanitarian aid and a protective "no-fly zone" to shield Kurds from Saddam's aircraft. Why didn't the elder Bush help the Iraqi people? Because he feared that a de-Saddamized Iraq might collapse, thereby upsetting the delicate balance of power in the Middle East (translation: we did it for oil and Israel). Because Baker was secretary of state while it happened, Kurds still look at him and see their blood on his hands. The year 1991 was not the first time the United States sold out the Kurds for the sake of so-called regional stability. In the early 1970s, the CIA funded and armed Kurdish insurgents fighting for regional autonomy in Iraq. The United States did so at the request of its Iranian super-friend, the Shah of Iran. At the time, the Shah (which means monarch) was trying to gain leverage over Iraq in a dispute about an oil-rich area on the border between the two countries. In 1975, Iraq gave up its claim on the border area in exchange for CIA and Iran halting aid to Iraq's Kurds. The most iconic betrayal of the Kurds by the United States happened in December 1983. Iraq (controlled at the time by Saddam Hussein) was at war with Iran (controlled by Ayatollah Khomenei). Despite clear evidence that Saddam Hussein was using chemical weapons not only on Iranians but on Kurds in his own country, the United States continued to funnel aid to Saddam. 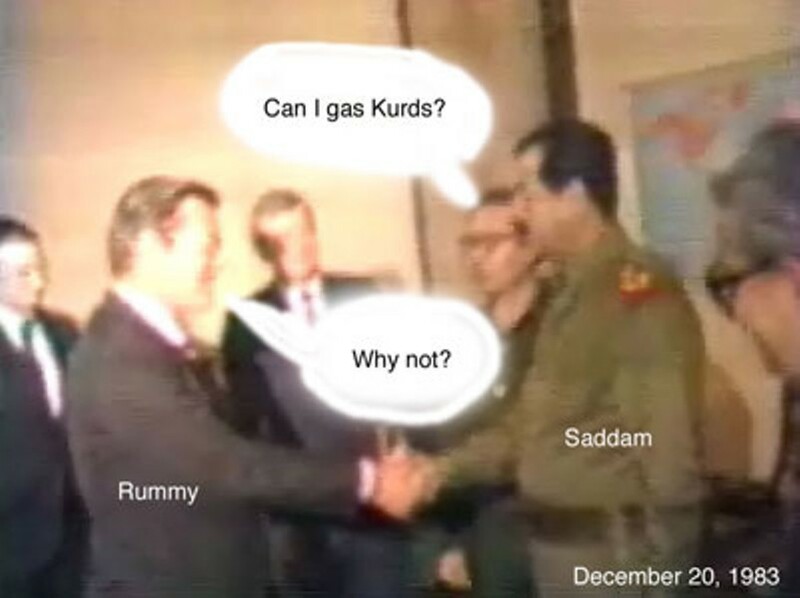 To make it clear to Saddam that the United States did not mind if he used chemical weapons, the Reagan administration sent a high-level envoy to Baghdad to meet with Saddam. That envoy was Donald Rumsfeld. Efforts by Kurdish leaders to meet with U.S. officials during the 1980s were largely rebuffed.